Penelope, this is a great article about the Great Wheels. I’m particularly interested because I spent some weeks in Yorkshire in 2000, researching for my Honours thesis on late 18th century worsted textiles. I’m a spinner and weaver myself, and as our guild here in my small Australian town have a Great Wheel, I have some experience spinning on it. One of the highlights of my Yorkshire trip all those years ago was visiting a museum in Huddersfield, and spinning on a 200-year-old wheel – which was so light and beautiful to use. None of the volunteer museum guides that day knew how to use it, and they were very happy for me to demonstrate; I probably spent about an hour on it. I also demonstrate on our Guild’s wheel sometimes. It’s such a meditative form of spinning. One of the things that astounded me about some of the worsted textiles from that era is how fine they were. For example, the camlets, callamancos, lastings and amens in the Hill pattern book in the Calderdale Record Office. The camlets are very fine singles yarn, and the wefts in the others are also fine singles – but the latter did not seem to have a lot of twist. Unfortunately I could only examine them visually, with a small magnifying glass – I wish I could have had a microscope, or been able to examine fragments of the yarns! These were much finer than many of the shalloons, bays etc, which led me to think that there must have been a sub-set of hand spinners who were quite skilled. It’s also my thought that the reason these beautiful fabrics didn’t survive is because they couldn’t be replicated by machine – the weft threads being fine and lightly twisted. I’d be very, very interested in your thoughts on this! Hello I live in Nova Scotia Canada. My ancestors on my mother’s side were from Yorkshire (Milners). Oh my, I’m SO thrilled to have found your blog and your historical knowledge of the Great Wheel is second to none in my humble opinion! Two days ago I obtained the elegant Great Wheel in fine working order for the outrageously cheap price of $90! I know some about spinning and it’s long been my dream to learn and to obtain a wheel. Finally my dream has become reality after purchasing it from a friend who had it in her gift shop that she is selling. She never used it only to attach mittens she made with clothes pegs. Oh I went to school with Milners – it’s a local name! Thanks for your compliments – and I’d love to see a photo or two of your wheel! I love a true English longdraw but the difficulty there is it only seems to work easily if you have immaculate fibre preparation but there are many ways that great wheel spinning improves other aspects of your spinning and prep… Enjoy your wheel! Penelope I sent you and email. Did you get it? Thank you so much C! Yes I have to agree Nova Scotia is a wonderful place. I feel very blessed to live here! I;m so thrilled to have been able to get this wheel and I’m over the moon! Thank you for you comments! Wonderful article. Thank you so much. I just bought an old Great Wheel at a Rescue Puppies Resale Shop. I fear it has a bad leg. Other than that, it seems sound. Would it ruin it if I got a woodworker to turn a matching leg. It is unusable without it. Could you please tell me how to obtain a spindle for a great wheel. My wheel came without one. Could I make a spindle? If so, what material? Wood? Metal? I don’t know where you’re located but your best bet is to track down a wheel-maker and ask them to help out. Some, not all, will have experience of Great Wheels and be able to help. In the UK there is only one active wheelmaker I know of – and I’m not sure whether he repairs wheels or not – but there are others, like Woodland Turnery, who routinely fix various wheels and if you’re in the UK, they would be a great place to ask. The alternative is to study them, preferably see a few firsthand in museums/auction houses/antique shops/wool shows and have a go, yourself. If you’re in the US, you might be able to track down a Mother of All. I’d find the relevant Group for your area, on Ravelry.com and post that you’re ‘In Search Of’ of Mother of All for a Great Wheel. You might strike lucky. I’ve just done a quick search – second post on this page might be interesting to you! I have seen both wooden and metal spindles. Check on the eBay online auction site as they quite often have all parts of the Great Wheel for auction. I have bought mothe-of-alls, spindles, accelerators and sometimes you can even get the whole wheel. Best spinning blog post I ever read. Thanks for this well-researched rebuttal, much appreciated! 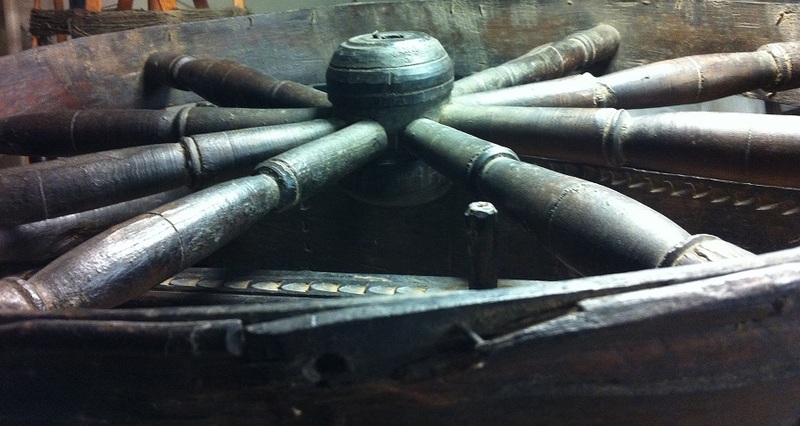 There were (and are) hand-driven spindle wheels small enough to sit at, all over India and across Turkey and into Eastern Europe. And charkas of course. 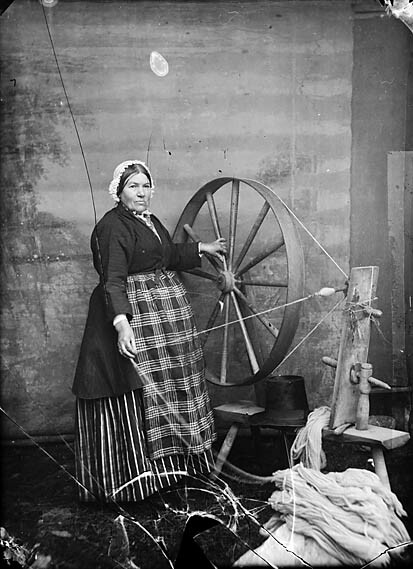 Also, the flyer/bobbin was invented separately from the foot-treadle; there are images of hand-driven flyer wheels earlier than the treadled ones. And to confuse the simple 2-types concept a little more, you can add in the modern Rio Grande wheel (oooh I want one!) 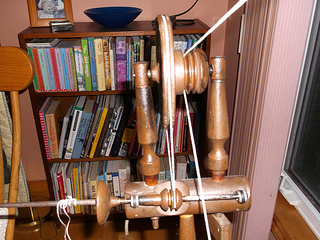 which is a foot-treadle-driven spindle “great” wheel. Great article and very timely as I am about to take my American Walking wheel with Benjamin Pierce accelerator head to the Rare Breeds Show at Singleton, Chichester. The visitors there are generally very interested in the history of spinning and you have given me lots more to say. Thank you! If you would like to see a spindle wheel in action there are daily displays at Quarry Bank Mill, Styal near Wilmslow in Cheshire, UK. I was fortunate enough to work there for over 20 years as a spinner/ weaver until health problems stepped in. It is a lovely sitting wheel, made by David Bryant whose lovely wife Val used to be my boss there. In earlier years we used an original wheel which I have a feeling Val said she found in an antique shop, long time ago so my memory may be skewiff, but it was a joy to spin with, felt like touching history, but the copy is a beautiful wheel too. Would expect nothing less from such a craftsman. Thanks so much for a fascinating read. Oh thanks for that, Carol. One of my sons lives in Cheshire, so I will try and get along there. Sounds brilliant. I have a spindle wheel – Jack Greene one – really enjoy using it when it’s not playing me up! I have a Jack Greene wheel- hasn’t played me up despite some heavy use during the last 10 years. It’s in use at Chiltern Open Air Museum during early august this year- and if spinners do want to try it- then I am open to giving the occasional lesson/try! I think the problem with mine was we stored it in separate pieces – last year in the heat, it was throwing the driveband (presumably the wood shrunk a bit) but we realised if we set it up a day or so before we used it, it would then be OK… The past few months we have started storing it (behind the sofa!) assembled, so now it’s fine! It went through a tempremental phase last summer, though! Great article- thank you, I’ve been trying to educate public when demonstrating a great wheel in an 18th century cottage for many years- most are, as you say, fascinated by the rhythm and the fact that one can actually see what is happening if the spinner slows the process down, Thanks for lots of details and good research- great wheels are also one of my things! What’s his whos’its is a bit of a blowhard and an ignorant one to boot. I wasn’t surprised at all to find that his was “the blog” to which you pointed. I stumbled across him when researching gansey knitting. 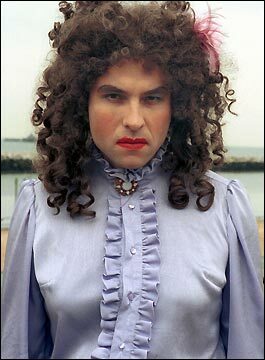 That said, I find your blog delightful and informative. If I lived on your side of the Big Water, I’d be taking a workshop (and doing some genealogical digging myself)! A very interesting article. I enjoyed it. Here in Denmark we had ‘spinning houses’ that were basically prisons for women and children picked up from prostitution and begging. They spun on great wheels very late – maybe up til close to 1800. Fun fact: a flyer wheel in Danish is a ‘rok’. A great wheel is a ‘skotrok’. I’ve spoken to someone who has seen him spin (a wheel maker and not his beloved AA). Apparently, he can spin at a consistently fast speed and this is mainly because of all the alterations he has done to his wheel. I was told he has some interesting ideas but nothing that compelled the individual I was speaking with to rush out to his shop and make. As a bonus, he added that one of the biggest problems with AA’s book is that things as put forth as facts when they are AA’s opinion. I always feel a bit sorry for AA as The Blog has probably cost him a lot of new potential readers – ie: he’s damned by association. Not an association he’d seek out, am sure. Which is a pity as his book has a lot to offer. And, right or wrong, his opinions are based on decades’ worth of solid experience and knowledge. I own a copy if AA’s book and refer to it despite the Blogger. AA is opinionated. On balance though, I agree he has a lot of valuable information. sigh…..his latest post is just as ridiculous. Your carefully researched, well written, and always entertaining and informative blog is a breath of fresh air. And when is the River Ganseys book coming out? I know I asked a while ago…having just gotten the book on Dutch fishermen’s ganseys, I’m dying to read yours! Oh thanks! River Ganseys is literally having its last edit from me today – I’m just putting in a new chapter heading where an old one fell out somehow, and then it’s captioning the images and we’re finally done… So it can’t be long! I still haven’t got the Dutch book yet but will get it soon as it sounds brilliant. I hope someone going to this show Blogger mentions will film him in action, treadling like an Olympic athlete (argh! just buy a faster wheel already!) We all need to see what it is he’s on about. Someone linked to a video of the excellent Abby Franquemont spinning on a fast wheel (Lendrum?) and Abby made it look so leisurely and relaxing – his ‘fast’ spinning sounds frantic and a little bit miserable. Fun is the whole point and I think he missed it. I do enjoy his blog and his intriguing ideas but when he strays into the territory of ‘history’… it gets embarrassing. For whichever university he’s an alumnus of, anyway. All opinions, nothing to back it up and always the ‘history’ twisted – or let’s be honest, totally fabricated – to fit a point. I don’t get it. Just don’t mention it, if you know nothing about a subject. In the words of Abraham Lincoln: “It is better to remain silent and thought a fool than to speak up and to remove all doubt.” History is a subject upon which Blogger should remain utterly silent. PS: Ooh just clocked the latest one about “The Cisterns”. Couldn’t make it up. Does he mean Cistercians? Reminds me. Must drop a new one of them blue toilet duck things in my cistern… And the ‘Victorian ladies’ have reappeared. I suspect that he may not have a degree from any college or university. Given the claims he’s made about his variety of work experiences you’d think he’d be bragging about his education too. His ‘claim to fame’ title at the engineering firm where he worked indicates that he was little more than a paper pusher. I was alerted by someone that his blog had been recommended in a blog post on the Knitty site. But the author added a disclaimer that they had been alerted by someone that he may not be the expert he pretends to be. I was wondering if they spun fatter as it is faster to get through a pound if it is a fatter yarn as opposed to thin. If you weren’t getting paid much to begin with, why take a lot of time with it unless you had a good work ethic. Well, passive-aggressive swipes at a particular spinning teacher via the Peruvian tradition is probably more accurate. But anyway, I was just mulling over your fascinating post, and wondered whether half the complaints about yarn quality were the standard scripted trade whinges-for-the-sake-of-whinging that have sod-all to do with reality. Every occupation has them. Wonderfully done, with bonus refutation of those offensive claims a few weeks ago about ‘subsistence’ spinners with other chores to do being unable to produce quality high-twist yarn. Passive-aggressive swipe at the Peruvian tradition, I suppose. Proving yet again that messy real history is far more fascinating than a load of self-aggrandizing fantasy any day. Although (groping desperately for positives) at least the blogger appears to have given up his daft theory that great wheels were used by a specialised profession of pliers. in the way of slubs. Or was it simply that they had to put up with beginners while waiting to get them good? Or they used plying to even it out? (Working wear clothing is found in walls and under floors, so ordinary cloth is available to study). Interesting article! Thank you for sharing your research! Yes, I’ve seen some beautiful broadcloth and linen as well. But I wonder if that survived because of its extremely high quality – those clothes were less workaday, and more valued? 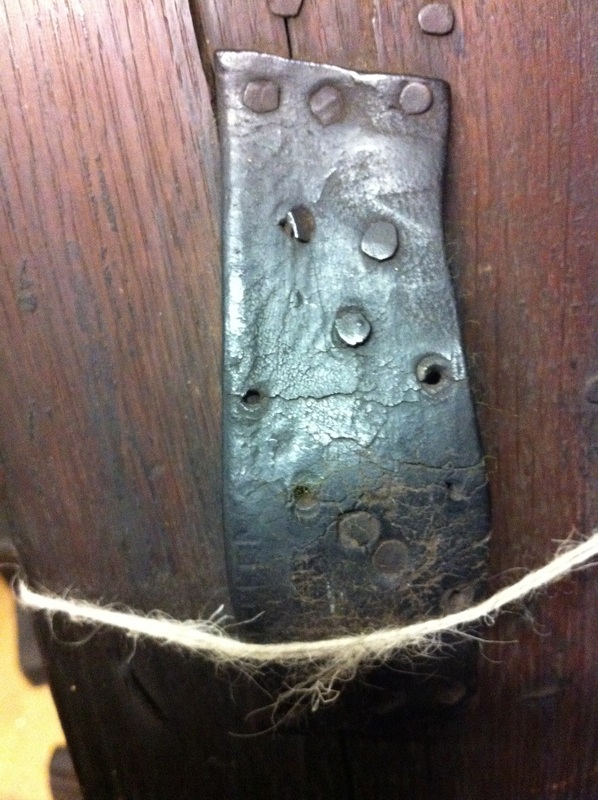 The vast majority of cloth woven would not have been the ‘superfine’, but the thicker, more serviceable stuff (plus a lot can be hidden by milling and tentering!) So whilst we know what they were capable of, in the past, a lot of the things woven would not be of the same quality as some of the fabrics in the finest quality clothing, which survived in greater numbers? Although I was emphasising the clothiers’ disenchantment with a lot of spinning, there, as that is what comes across in the sources and that is what contradicts Our Hero. ;o) I think the majority of the spinning I am talking about there, though, was for things like fustians, stuff, callamancos, sayes etc that maybe weren’t as great as broadcloth (we buy fabric for re-enactment from Hainsworth’s and the broadcloth from them is about the same as it would have been in the 19thC – it is amazing). My bet is that it means anything he wants it to mean and will change depending on the circumstance. From my little knowledge, there is only one way to make a flyer wheel spins faster – increase the ratios. You can achieve that by making the drive wheel larger ( and then changing the whole wheel to make the new drive wheel fit), or by making smaller whorls. The problem with making smaller whorls is that you’re limited by the diameter of the flyer shaft and the intrinsic properties of the material used to make the whorl (aka, if you carve too deep into the wood, it will break ;P). I could be wrong (I can never read that blog long enough to (try to) make sense of what is being said – my eyes roll and I get angry), but I think some of the numbers being tossed around there are lies wrong. Thanks for a lovely, educational and engaging post. I’ve never spun on a great wheel, but the little knowledge I have, plus some logical thinking tells me that a great wheel is the best choice for production work. It baffles me that someone who claims to be a physicist has forgotten about the basics when it comes to ratios and their relation to speed – why else would production flyer wheels have bigger drive wheels? Is a point that hadn’t occurred to me! But yes, that has to be right. Thinking of those Canadian and Scandinavian production wheels… I always remembered Ella Baker writing in the great wheel themed Spin Off: “… The ratio of my wheel is 322:1 (by count)…” she goes on to say slippage is a factor, but I think when we’re talking 322:1, all that is a bit academic! You’re stopping and starting a lot on the great wheel, to wind on – but it’s surprising how little that actually slows you down, with longdraw as I’d stop to let the twist build along the drafted slub, in any case, so there is always a rhythm going on where you are stopping and starting anyway, even with a flyer wheel when doing longdraw, in a sense. The fact that he tosses away common physics knowledge like that to make his point is one of the (many) red flags that lead me to believe that his BS goes further than just “you can’t spin as well as I do, because you ain’t got a Y chromosome”. “You’re stopping and starting a lot on the great wheel, to wind on” Interesting. 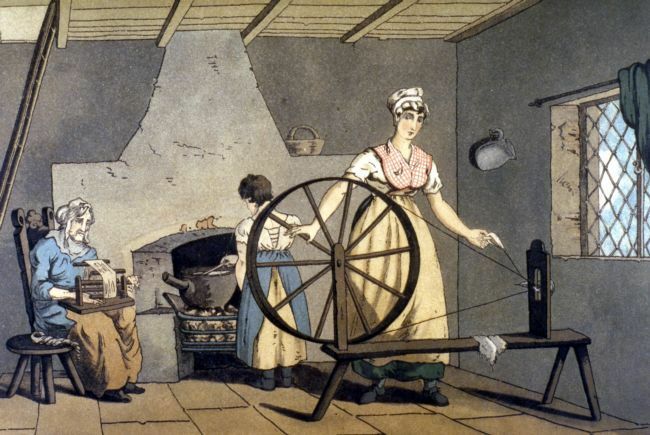 I’ve never seen anyone spin on a great wheel, and thought that you could time it in such a way that you’d use the decreasing of speed to wind the singles/yarn on the spindle, so by the time the wheel had almost stopped moving, you’d be close by it to make it spin again. (do I make sense?). I only spin short draw, but stop a lot too because I’m always picking something out of the roving. I never had any doubt that a great wheel is faster, though – maybe because I remember my high school physics classes. I still can’t fathom what he means by ‘an accelerator’ on a flyer wheel? Let alone that strange statement about great wheels never having ‘accelerators’ when it’s a matter of common knowledge they did – and some still do..? It seems almost willful. Well-cited research! How remarkable! 😉 Many thanks for this–educational, witty, and fascinating, even for a non-spinner. That blog is so full of skewed statements and self-glorifying twaddle! Although several other spinners and I have been speculating for years, we still have been unable to decide on his aims. I suppose the general consensus is that he plans to write a book. What a very bad book it will be. A couple of years ago there was someone at Wonderwool from the National Wool Museum who was demonstrating a great wheel. The speed was wonderful – certainly a match, if not better, than a flyer wheel. I was itching to have a go! If we have enough space, and a choice, we often would take a great wheel to a living history demo rather than a flyer wheel because the public seem to find the GW so fascinating! I think there is a rhythm and a magic to it – the way you walk and stand, and how you have to hold your arm… Whenever I see a medieval illustration of a GW spinner, I love it because what you’re seeing is precisely the way you do it, too! 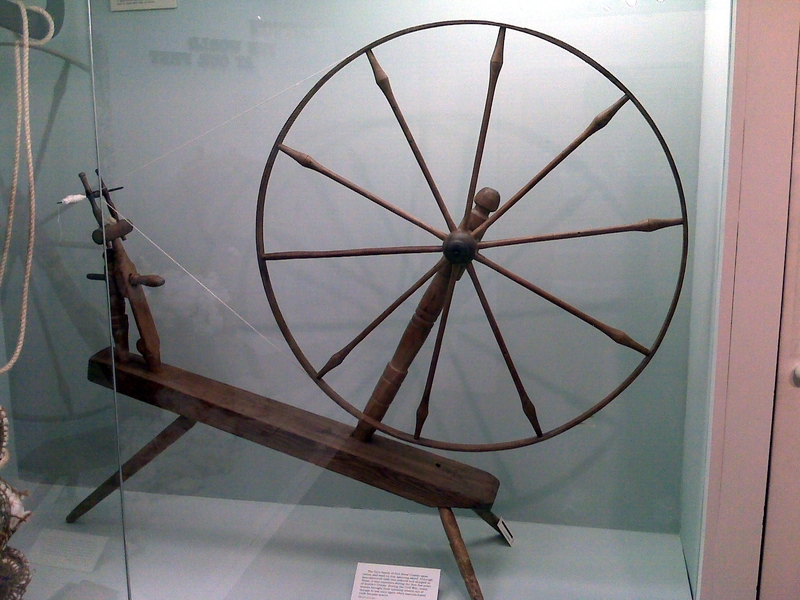 The older I get, the less I like the ‘walking’ of the walking wheel – apparently they made smaller ones to sit down to, as well, to spin cotton! I suppose a charka might be fun!